To be an effective soldier in the Civil War, a man needed to know much more than how to drill on the parade ground and how to fire his musket. It was mostly the hard school of experience that turned a green recruit fresh from his country home into a lean, weatherbeaten soldier who was able to march all night and fight all day on scant rations. Many volunteers did not survive long enough to make the transition. Adaptation to army discipline and regimentation was one of the first trials of the new soldier. The idea of showing respect to and obeying the orders of a higher-ranking soldier irrespective of that person's prewar social standing, family, or wealth required a major psychological adjustment for many men. Providing for physical needs posed severe difficulties in Civil War armies. Soldiers had to learn how to properly cook the rations that were issued to them and how to forage for supplemental food. They learned what they could do to help prevent scurvy, typhus and other camp diseases. Bad water and poor sanitation caused the death of many soldiers. Survivors learned the value of proper sewage disposal and the necessity of clean drinking water. They learned how to build shelters to protect themselves from the elements and how to make repeated all-day marches and they also learned the necessity of maintaining their clothes, shoes and weapon. 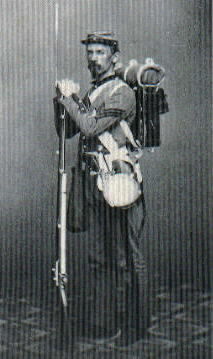 Volunteers went off to fight at the beginning of the war with a great deal of baggage-both army-issued equipment and personal items. In the early days of the war, a soldier carried ten pounds of gun: eighty rounds per man of ball cartridge, one pound of powder and five pounds of lead. Heavy equipment included; knapsack, haversack, three-pint canteen, all full with 3 days rations, rubber blanket, woolen blanket, shelter tent, full winter clothing, tin cup, tin plate, knife, fork, spoon, stationery, photographs, journal, Bible, tobacco, pipes, comb and brush, shaving tools, sewing kit, toothbrush, soap and whatever other gear did not hang from hooks on their belts. Soldiers had to carry their own gear and weapons and they soon discarded all but the essentials. Many soldiers even quit carrying extra clothes, just wearing what they had on. The haversack, a foot-square canvas bag with a waterproof lining, a buckled flap, and a strap that was slung over the right shoulder, became the soldiers' indispensable carryall. It was designed to hold three days' rations, but the men would usually eat them all on the first day rather than carry the weight. This left the haversack free to carry a few personal items and most important, apples, blackberries, and other forage. When the fighting started in 1861, many North and South inventors began producing metal shields, helmets, and vests promoting them as being bulletproof. Both governments tested and considered issuing armor to their men, but both rejected the idea, primarily because of the cost, which depending on the design would range from $5 to $15 per man. 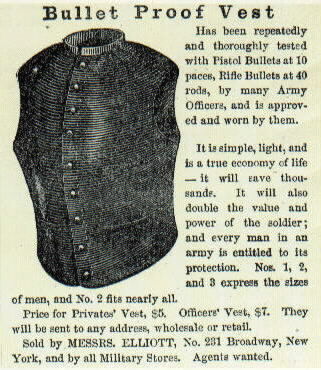 One ad for armor in Harper's Weekly claimed its product had been "repeatedly and thoroughly tested with plated bullets at 10 paces, rifle bullets at 40 rods, by many army officers and is approved and worn by them," but when the soldiers tested them, the results were tragic. In the first year of the war many men bought their armor privately; some entire regiments were outfitted with it before marching off to battle. Soon, however, bulletproof vests and the men who wore them were held in contempt by their fellow soldiers. The armor was hot, heavy and uncomfortable and because the extra 10 pounds of steel plate was too much to be carried on long marches, thousands of vests were discarded in roadside ditches. Hats provided soldiers warmth in winter and shade in summer, offered some protection from rain, and served as handy bags for carrying foraged eggs and blackberries. The styles of hats most commonly worn during the Civil War were the forage cap and its cousin the kepi. The original 1858 forage cap had a narrow leather visor and a high crown with a round, usually perfectly flat, top that flopped forward at a sharp angle. The kepi was a french-style forage cap with a lower crown and a top that tilted at a smaller angle. Where the top of a forage cap was flat, a kepi usually had a raised roll around the outside of the round, otherwise flat, top. Confederate regulations called for the color of a kepi to match the wearer's branch of service; red for artillery, yellow for cavalry, dark blue for staff, and light blue for infantry. Most, though, were some shade of gray because of dye shortages. Officers added gold braid; one strand denoted a lieutenant, two a captain, three a field officer and four a general. The Hardee hat, a stiff, high-crowned, wide-brimmed style that was the official dress hat for union officers and enlisted men, was universally disliked. Union soldiers modified it or discarded it for headgear more to their liking, usually choosing kepis or forage caps. Some units became known for their distinctive headgear. Wisconsin's "Black Hat Brigade" was so named for the color of headgear all of its members wore. Zouave units wore a wide variety of tasseled turbans and other exotic hats. The 79th New York, called the Cameron Highlanders wore the style of cap called the glengarry for dress occasions and at the start of the war when they marched from New York into Washington. 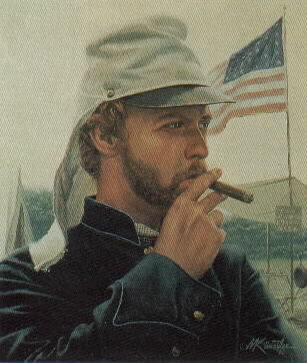 In battle however, they wore the chausser style kepi with the small New York State seal button on the side. While their fellow Scotsmen in the 12th Illinois wore tam-o'-shanters. One additional item given to Civil War soldiers on both sides was the havelock, a cap cover made popular by Sir Henry Havelock of the British army in the Sepoy Rebellion in India in 1857. Made of white linen or cotton, the havelock was to be worn over the soldier's cap with its long tail covering the man's neck. The havelock was supposed to protect men who were fighting in hot climates from sunstroke. But the soldiers found the havelock actually made them hotter by not allowing air to circulate around their head and neck. Many Civil War soldiers used their havelocks not as cap covers, but as coffee strainers, dishcloths, or gun patches. If the Union or Confederate soldier was not a horse-mounted cavalryman or officer, he was a foot soldier. Throughout the war, these men marched long and hard, sometimes up to 30 or 40 miles a day. As a result, shoes became sorely needed by both sides. The Union, backed by its industrial strength and factories, had the benefit of the sewing machine, a newly perfected invention that enabled thousands of Northern shoemakers to leave their benches and become soldiers. But the Confederacy fared far worse; it was extremely low on shoes. Worse still, corruption existed in some Confederate commissaries, where quartermasters shorted the soldiers and profits were pocketed. There are many accounts of Rebels marching for miles barefoot during the winter. Ill-fitting shoes were also a problem, and carefully guarded shoe shops, situated close to brigade headquarters, were established to repair footwear. Often, Rebel foot soldiers with no shoes or poorly fitted ones were organized into separate commands to march apart from the rest of the troops on the soft grassy roadsides. The men preferred shoes with broad bottoms and big, flat heels, instead of boots, which were heavy, twisted the ankles, and were difficult to put on and remove especially when wet. 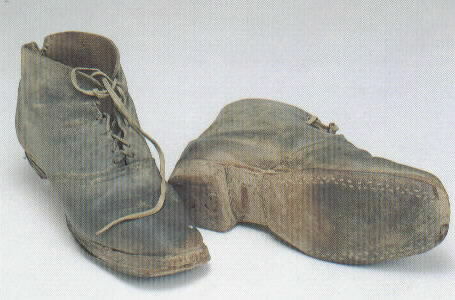 Shoes and boots were so valuable that special missions were made to procure them. They were even pulled from the feet of dead men on the bloodstained battlefields and were used by prisoners to barter for supplies such as food or tobacco.